You’re not the only one with questions about the extrusion process. That’s why we developed this list. You’ll find answers to the most common extrusion-related questions we’ve heard over the past few decades; and we’ve heard a lot! Jump to a section using the links below, or simply scroll down to spark your curiosity. How do I contact you? Where are you located? How do I design an extrusion profile? How much does extruded plastic cost? My project requires an NDA. How do I submit that? What material is best for sealing? How can I prevent seals from buzzing, squeaking, and rattling (BSR)? How can I prevent a seal from staining a mating surface or bleeding? What is the white powdery substance that builds up on the surface of a rubber part? What are the alternatives to rubber seals? GPI, Sierra Plastics, and GPM are Gemini Group’s extrusion business units. We typically work with large customers such as OEMs and Tier 1 suppliers. The majority of our accounts require at least 10,000 parts annually and have an annual buy north of $100,000. If this sounds like you, we should connect. You can drop us a note online, give us a call at (248) 435-7271, or email us at plasticsales@geminigroup.net. Gemini Group’s extrusion business units include GPI, Sierra Plastics, and GPM. GPI is located in Ubly, Michigan; Sierra Plastics in El Paso, Texas; and GPM in Saltillo, Mexico. Please visit our Locations page for location details and contact information. Gemini Group’s extrusion business units include GPI, Sierra Plastics, and GPM. GPI and Sierra Plastics are ISO 14001:2004, ISO/TS 16949:2009, and WBENC certified. GPM is ISO/TS 16949:2009. You can view the certifications here. For a complete list, please visit our Materials page. If you need help choosing the best material for your unique application, we can help! Contact us online or learn more about material selection in The Engineer’s’ Guide to Selecting an Extruded Seal Material. We’d be remiss to provide an answer without understanding the scope of your challenge. That’s why we’ve developed an Extrusion Design Guide. 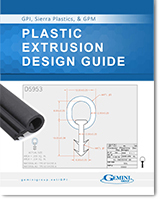 It provides the basic facts you’ll need to start the plastic extrusion design process. Every extrusion solution is unique deserves a custom quote. Though many of our jobs are custom, we can help you determine if an existing profile will work for your project. Request a Quote to learn more. You can attach your NDA to our RFQ form or send it directly to plasticsales@geminigroup.net. There is no “one size fits all” material that works for every seal application. That’s why we’ve developed The Engineers’ Guide to Selecting an Extruded Seal Material. It provides stats and specs for dozens of extrusion materials and will guide you through the most critical considerations so you can make the best choice possible for your unique application. Buzzes, squeaks, and rattles (BSRs) are 100% preventable, yet they remains a major source of warranty claims. This is typically the result of improper material friction characteristics, chemical reactions, and/or environmental factors. To prevent seal chatter, take a look at the surrounding system. To what, and how, will the seal be attached? What is its proximity to other components? Will it be exposed to extreme temperatures, chemicals, or ozone? Once you have an understanding of the application’s environment, you can predict potential BSRs and determine the best method of prevention. Some of the most common solutions include the application of a slip-coat, blending a slip-agent directly into the seal material, and applying flock tape or spray to exposed surfaces. How can I prevent a rubber seals from staining or bleeding? Staining and bleeding have long plagued rubber seal applications. Fortunately, you can prevent it. Staining happens when additives in the rubber have some solubility with a mating surface; such is the case with the infamous rubber-footed table stain in the linoleum-floored kitchen. You can prevent this by creating a barrier between the mating materials. Bleeding is the seepage of rubber additives, namely oils. There are some rubber compounds that are resistant to bleed, but the only way to prevent it entirely is to use an alternative material such as TPV. This phenomenon is referred to as “blooming,” and occurs when compounding agents in the rubber migrate, or bloom, to the surface. This is due to the agents’ limited compatibility with the rubber elastomer. It affects the tensile strength, adhesion properties, and appearance of your part. Depending on your seal application, you may have numerous alternatives to rubber. The most common is TPV, a rubber-like material that can be processed and recycled like plastic, but without the stain, smell, and blooming you see with rubber. It’s like a simplified rubber, allowing for more flexible part design, quicker manufacturing, reduced part/system costs, and weight reduction. Some other alternatives to rubber include TPO, TPU, TPZ, and PVC among others. To help you navigate the sea of options, we’ve developed the The Engineers’ Guide to Selecting an Extruded Seal Material. Contact us today to learn more about the extrusion process and Gemini Group’s extrusion division.